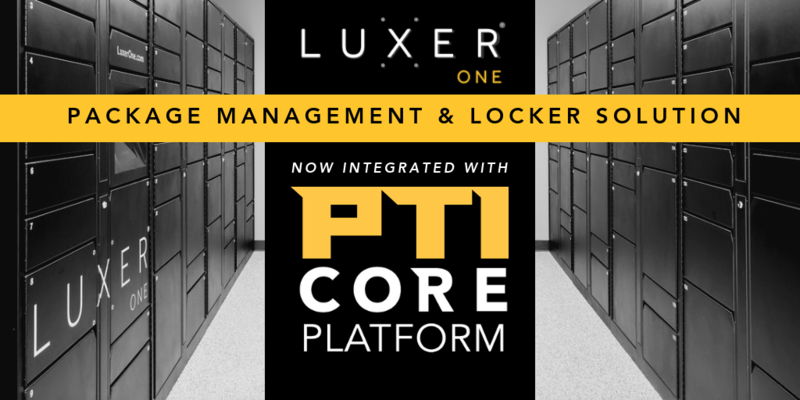 [SCOTTSDALE, AZ – March 28, 2019] PTI Security Systems, the global leader in access control technologies for the self-storage industry, announced a new integration with Luxer One through their Internet of Things (IoT) end-to-end solution, PTI CORE™ Platform. Primarily based in residences and retail stores, the concept of Luxer One’s automated smart locker system is the first of its kind in the self-storage industry. The integration of Luxer One through the PTI CORE custom dashboard allows property managers to accept packages on behalf of their tenants through notifications, providing self-storage businesses with the ability to differentiate their property’s services with a secure shipping solution. Interested parties can experience a live demonstration of the PTI CORE and Luxer One integration at the upcoming Inside Self-Storage World Expo in Las Vegas, Nevada, on Tuesday, April 2, from 3 p.m. to 7 p.m., and Wednesday, April 3, from 1 p.m. to5 p.m. at booth #619. For more information on the Inside Self-Storage World Expo, please visit www.issworldexpo.com. For more information about PTI CORE™ integrations, cloud software, and the PTI Marketplace, please visit www.ptisecurity.com/core/. About PTI Security Systems: PTI [www.ptisecurity.com] has been in the access-control and technology business since 1979 and is the most trusted name in self-storage security. To date, there are more than 40,000 installations of PTI products in self-storage facilities in more than 30 countries. PTI provides the most innovative, durable, and reliable security products available today, and offers a wide range of integrated security solutions that help create a seamless experience for both tenants and self-storage owners and operators. PTI’s industry-leading security solutions include: the EasyCode mobile app, the #1 selling keypads in self-storage, wired and wireless door alarms, and easy to use software solutions designed to help you manage your security system in real-time from anywhere on Earth. About Luxer One: Luxer One develops the world’s leading package management solutions, with a suite of smart package lockers and automated package rooms designed to accept 100% of deliveries. The Luxer One team started innovating 24/7 automated locker solutions in San Francisco in 2005. Today, the company holds four patents with two pending, and has performed over 25 million locker deliveries globally through its advanced technology platform. To learn more about Luxer One, please visit www.luxerone.comor contact press@luxerone.com.